This ended up being a process project. I love the look of the linen stitch. However, these socks don’t suit me. Footsies? Sure, I wear them. Mid-height? You betcha. Anklets? Nope. Fortunately, Mom’s co-worker loved and adopted them. 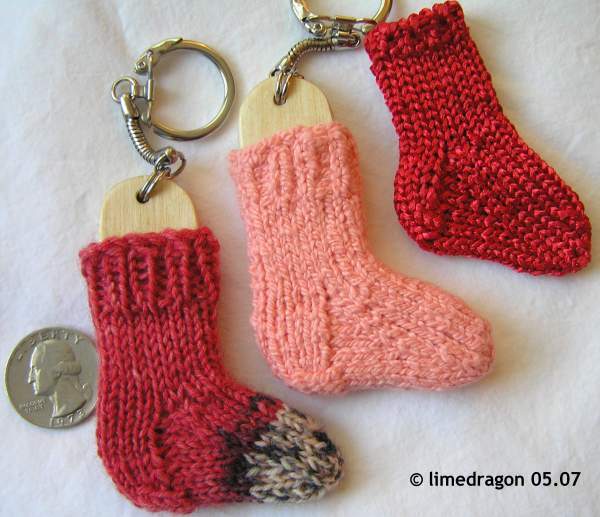 These little sock blocker key chains are available from Felt Up (and several online retailers). I’ve only knit one previously; I gave it to my cousin for her birthday last year. Recently, one of her friends asked if I could make a couple, one in red, and one in pink. I wasn’t sure I had any appropriately-colored scraps, but luck was with me. I had just enough Opal Ladybug left over* to use for one and found for the other a sample of pink Cascade Fixation from a Yarn of the Month Club shipment. Perfect! That third (topmost), shiny one you see is another sample from YotM, but I’ve forgotten the details. It’s a shiny and skinny ribbon yarn from�possibly�Katia. It was the first of this group knitted because I could not remember the adjustments needed for socks to fit these blockers, other than increasing the specificed needle size. This sock does fit over the blocker well enough, but stretches unattractively in the gusset and gives the impression of holes where there are none. I’m saving this one to use as a Christmas ornament. For the other two, I used US 2 (2.75mm) DPNs with 18 stitches overall, instead of the 16 given in the pattern. Adding two rows to the heel flap also helped minimize the illusion of gusset holes. I omitted the last decrease round in the toe, which was too pointy for my taste. They’re very cute and I hope the recipient is happy with them! *Previous projects with just this one skein of Opal Ladybug: one pair of adult socks, one pair of baby socks, and one 7″ square (not yet blogged). 4 projects from one skein, whew! Man, if I started making little socks there’d be little girls knocking at my door with their baby dolls! I love my mini-keychain blocker. I dress it up all the time. It’s the only “accessory” I relly have. Lucky coworker of your mom’s! Those are great socks. I have the same buttons! These are SO cute! I have a co-worker whose sister knits and makes these as earrings. Usually I see them around Christmas for their “stocking” likeness. Ya…I didn’t knit those socks either. I also thought the weight of the buttons might drag them down a bit. How cute, they are so little! I love the look of the linen stitch too. I’ve heard that they aren’t quite joyful to knit from others too though. WOW they’re so tiny. very cute. I’m with you on the Rockin’ Sock Club socks, I wasn’t part of the club, but I’m sure I’d knit them because they are so different, but not my style to wear. Your teeny socks are darling! Shut the front door…those teeny socks are too cute!